Spring Happenings at SOCO and The OC Mix! Hello, Spring! We’re excited to share the below upcoming events happening at SOCO and The OC Mix this season. 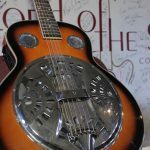 Be sure to visit our website for a full list of events, and follow@socoandtheocmix for information about giveaways, the latest updates, announcements, and more! Join us this Sunday, March 25 for the popular Lord of the Strings concert series at LCA Wine with Acoustic Eidolon – a unique blend of guitar, cello and vocals resulting in some of the most beautiful and thought-provoking music on the scene today! Doors: 2:00 pm. Show: 3:00pm. Click here to purchase tickets. On Saturday, April 14 from 10:00 a.m. – 4:00 p.m., join some of OC’s most beloved local vendors at Paul Mitchell The School at SOCO for a FUN-RAISER benefiting Children’s Miracle Network. You’ll enjoy shopping with vendors such as Scentsy, LuLaRoe and LipSense – and a portion of your purchase will support local kids in need! Calling all eyeglass aficionados! Save the date for this fabulous trunk show on Sunday, April 29 from 11:00 a.m. to 5:00 p.m. 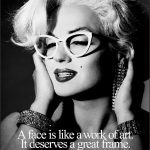 This free event will feature trunks chock-full of colorful and unique L.A. Eyeworks frames and a portrait exhibit showcasing fabulous black and white portraits from the popular “Your Face is Like a Work of Art. It Deserves a Great Frame” campaign. Click here for more information. On Saturday, May 12 from 9:00 a.m. to 2:00 p.m. you’re invited to kick off Second Saturdays at SOCO’s Farmers Market! 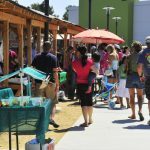 Located in the heart of SOCO and long known as the perfect place to spend a Saturday and purchase the best in local produce, the newly expanded market will run through Summer and include more farmers, artisans and vendors than ever before. Raise your glass for a toast to Spring at SOCO and The OC Mix’s ROSÉ Soirée! You’ll enjoy live music in SOCO’s beautiful courtyard while sampling a curated selection of more than 20 rosé wines hand selected from Provence, Europe and The New World by Orange County’s own LCA Wine alongside meticulously paired rosé inspired bites by ROSÉ Catering & Events. What better way to celebrate Spring? Coming May 17, 2018.